The ZMD-DC-SBN6 is one of the latest 16CH standalone DVR featuring advanced security functions. With the capacity to record from 16 cameras, it is highly recommended for business. It provides the basic surveillance function at an affordable price for your security surveillance needs. With ZMD-DC-SBN6, you’re able to know what is happening at your home or business wherever and whenever you want. 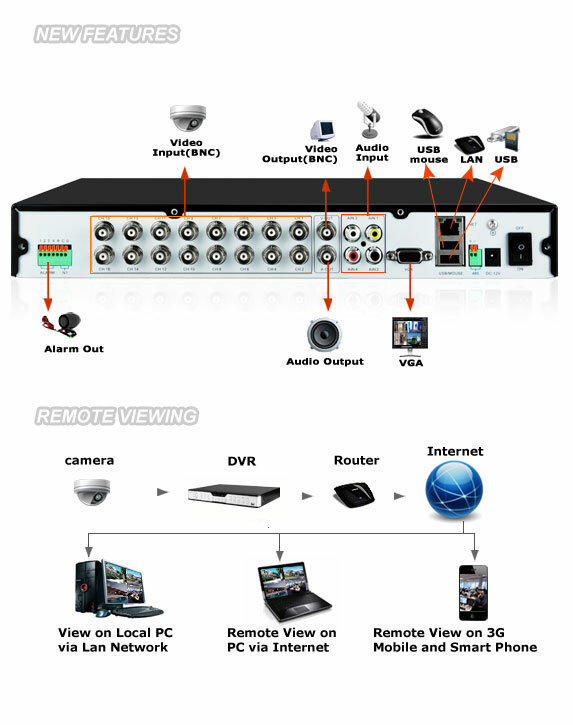 You have the power to access your DVR’s live video footage over the internet or directly from your supported smart phones, including: Android™; iPhone® & iPad® IOS; Symbian™; Windows Mobile®. ZMD-DC-SBN6 supports various kinds of recording modes, including manual recording, scheduled recording, motion detected recording, alarm triggered recording and alarm/motion detection triggered recording. Six viewing modes allow you to view 4, 6, 8, 9 or 16 cameras at once on a split screen, or view only 1 camera at a time. The motion detection option allows you record only when motion is detected so that you save hard drive space without missing important events. You can even ensure that false alarms are not triggered as the easy motion detection “mask” allows you to block out areas with constant movement. Once the motion detection sensitivity meets alarm conditions, email will be sent immediately with the attachment of the caught snapshot. Once the FTP is set, FTP will upload the file after the alarm, and FTP server will receive the caught snapshot. The multi-tasking feature allows up to five functions to occur on the system at one time: record video, watch live video, playback video while also monitoring and managing the system remotely, and also backing up files. A built-in USB port gives you the option of backing up and transferring your video footage with a USB flash drive or external USB hard drive. Simply choose the desired date and time range, and the requested video clips will appear. Clips are also labeled by event, which makes it easy to find particular footage. VGA and BNC output allows you to connect to any PC monitor or TV monitor for viewing purposes. This gives you more options when viewing the activity captured by your cameras. 1TB hard drive included in this DVR can record up to eight days continuously with full 30fps on all the 16 channels. Wow! What a great product! I installed a 1TB SATA HD into the DVR very easily. I turned on the DVR and it was surprisingly quiet. All video images came up very quickly. The controls and remote are all very easy to use. The Zmodo tech support staff were very friendly. If you want your surveillance system set up quickly and at a good cost, this is a must buy!